BAGHDAD -- The Islamic State of Iraq and Syria (ISIS) has launched two chemical attacks near the northern Iraqi city of Kirkuk, killing a 3-year-old girl, wounding some 600 people and causing hundreds more to flee, Iraqi officials said Saturday. "What the Daesh terrorist gangs did in the city of Taza will not go unpunished," Iraqi Prime Minister Haider al-Abadi said, using an alternative name for ISIS during a meeting with village elders in the small town of Taza on Saturday. "The perpetrators will pay dearly." "We took her to the clinic and they said that she needed to go to a hospital in Kirkuk. And that's what we did, we brought her here to the hospital in Kirkuk," he said. Wais said his daughter appeared to be doing better the next day so they took her home. "But by midnight she started to get worse. Her face puffed up and her eyes bulged. Then she turned black and pieces of her skin started to come off," he said. "We have a number of instances where ISIL has used chemical munitions on the battlefield," Brennan said. CBS' Scott Pelley asked Brennan if ISIS has access to chemical artillery shells. The day before the strike on the chemical weapons building, U.S. aircraft targeted a top ISIS commander, known by the alias Omar the Chechen, who the Pentagon considered to be the equivalent of the group's Secretary of Defense. U.S. intelligence was trying to confirm if he was in fact killed. Experts also say the extremist group appears incapable of launching a large-scale chemical weapons' attack, which requires not only expertise, but also the proper equipment, materials and a supply-chain to produce enough of the chemical agent to pose a significant threat. Separately, attacks across Baghdad Saturday killed 13 and wounded 27. The attacks were mostly carried out with homemade bombs placed along roads in the capital's southern and eastern neighborhoods. There were no immediate claims of responsibility, but ISIS often claims responsibility for bomb attacks in the Iraq capital targeting civilians. As the group has endured territorial losses in Iraq -- most recently the city of Ramadi which was declared "fully liberated" by Iraqi and U.S. officials last month -- they have stepped up insurgent style attacks in Baghdad and other areas far from the front lines. Hamish De Bretton Gordon, a former British army officer and chemical weapons expert, says the use of chemical weapons by ISIS also appears to be linked to losses on the battlefield. "As they get more and more pushed, we're seeing them use it more and more often," he said. "They are trying to prevent defeat." The mustard agent that ISIS is using is not very toxic, Gordon says, but "it has a huge physiological impact that far outweighs its physical impacts." 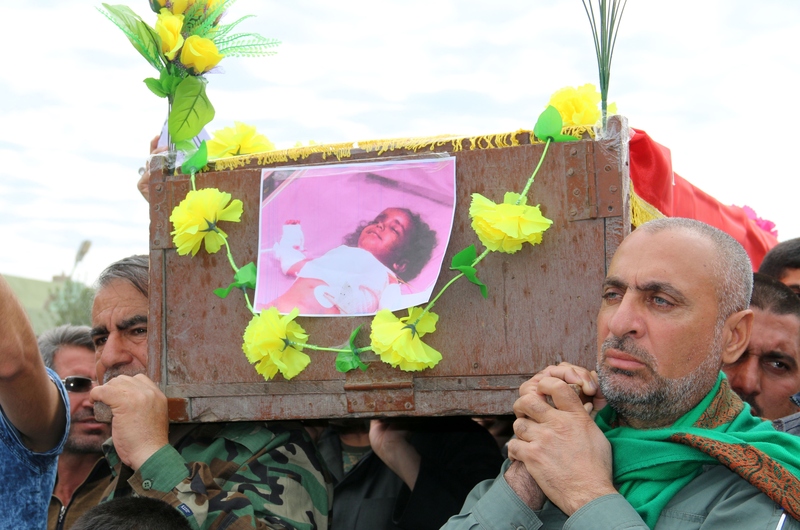 Fatima's father Wais said he was planning to return to the frontline with ISIS as soon as possible. "Now I will fight Daesh more than before, for Fatima."